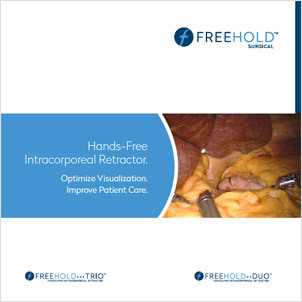 FreeHold Duo® and FreeHold Trio® Retractors are the only fully adjustable, hands-free, completely intracorporeal organ retractors that enable full surgeon autonomy while both optimizing visualization and minimizing incisions during laparoscopic and robotic procedures. See our adjustable retractor in action. Surgical retractor ideally suited for sling-based retraction. Used in a broad range of surgical procedures for tissue manipulation.